The welding team at Anglim’s Western Metal Works is committed to quality workmanship and results – whether we’re tackling a big industrial project or working with an individual to create a one-of-a-kind metal sculpture. If you need custom metalwork for your home or commercial space, we can help you to make your plans a reality! and render it in three-dimensions through a variety of metal cutting and shaping processes. Our computer-guided waterjet cutting machine and other CNC tools ensure that each cut is crisp and precise, and we pride ourselves on clean welds that will withstand time and wear without sacrificing beauty. If you’re interested in ordering a one-of-a-kind metal sculpture, sign, or other artistic piece of metalcraft, contact us today! We’ll be happy to discuss the details of your project and provide a quote for the work. We can also answer your questions and help you decide if we’re the right fit for you. 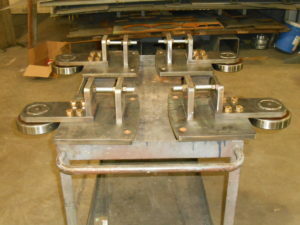 Call 505.822.9170 for a quote on your custom metalworking project today.